Fortunately for all of us afflicted with terminal toolaholism we are not the first ones down this path of compulsion; we stand on the shoulders of giants who got there first and established well-oiled mechanisms to feed their “needs.” EAIA, M-WTCA, MJD, Superior, all there to provide you with a focus for spending to satisfy the urge (if you sign up for the latter two they will deposit tool listing directly into your email in-box). 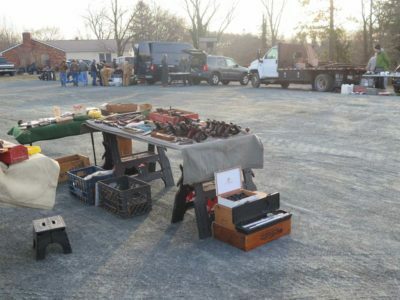 Another such group is the Potomac Antique Tools and Industries Association that meets monthly, and once a year holds its mondo crack-house flea market, dealer sales and auction event. Since this often coincides with the Highland Maple Festival back home I can attend only occasionally. This year was one such occasion, as our guests for that weekend of the Maple Festival canceled and I was free. So off to Damascus MD I went with a little money and a shopping list. The tool flea market in the parking lot begins around sunrise, or so I am told, I generally arrive about 7.30 and find the festivities well underway. 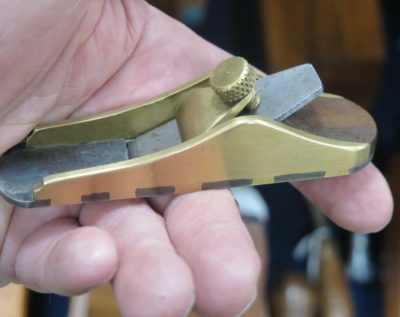 At 9.00 the inside dealer sale opens, and the morning is spent fondling, testing, purchasing, and yakking about tools. I almost pulled the trigger on this one, but the quality/price point just wasn’t good enough. But next time I will recount the great deals I did make.